We’d love your help. Let us know what’s wrong with this preview of Mercy Killer by James H. Pence. A serial killer roams the halls of Sentinel Health Systems who’s dedicated to setting people free—with or without their permission. Dr. Lori Westlake wishes she could help her terminally-ill patients end their suffering on their own terms. So when she’s invited to join the Circle of Peace, a clandestine euthanasia society, she sees it as a possible avenue for her conviction A serial killer roams the halls of Sentinel Health Systems who’s dedicated to setting people free—with or without their permission. Dr. Lori Westlake wishes she could help her terminally-ill patients end their suffering on their own terms. So when she’s invited to join the Circle of Peace, a clandestine euthanasia society, she sees it as a possible avenue for her convictions. But Lori’s sister, who also works at SHS, couldn’t disagree more. She believes people are dying who shouldn’t be dying, and she’s determined to find out why. When Lori is accused of murder, their only hope of finding the truth comes from an unlikely source—a former police detective recently diagnosed with ALS who is wrestling with his own powerlessness against his horrible disease. To ask other readers questions about Mercy Killer, please sign up. Before I share my thoughts on this particular novel let me tell you that the author is donating the proceeds from the sales of the book to ALS research. When I began reading this robust story, I wasn’t quite sure which direction the action or plot was going in, but am I glad to have read the book. Part of the story is mystery, suspense, thriller along with faith and ethics. One main character, Dr. Westlake, spoke loudly for helping patients end their lives until it came to a crossroads of putting her beliefs into action. When a patient of hers is found dead in a hospital room in the wee hours of the morning before a scheduled surgery, the lead detective is all but convinced Dr. Westlake is the culprit. Charles is a retired cop, living with ALS and living on the brink between giving up and fighting to live another day. David is an old partner who realizes that while Charles’s body may not work right anymore that doesn’t mean he is useless. In fact, his years of experience as a cop would be of great value, so he comes up with a way to keep Charles active. Over the years the detectives have solved many cases and along the way they encountered a batch of unsolved cases that David fears may be tied together, all because the killer’s calling card is a little ceramic angel left by the body. With each page the audience turns the deeper and more intriguing the mystery gets. Trying to figure out who the antagonist of the story was proved to be a challenge for me. There were times I thought I had figured out the bad guy or woman and thought all I was going to discover was how they got caught. However, it proved to be much more diabolical with the twists of the plot the author adds. I read another story written by James Pence called, Unseen, which I also highly recommend. 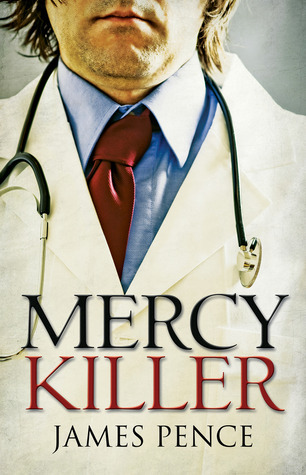 Now, I can also recommend Mercy Killer as a novel to add to your collection. This is a top notch author with an extraordinary tale that will bring hours of enjoyment. A true thriller, this book really made me think. I will never look at ALS (Lou Gehrig's) or the idea of ending one's own suffering the same way again. But it's really a thriller, a sometimes-scary-serial-killer kind of book. You just end up more compassionate and aware of what so many people are dealing with. People a lot of us don't usually think much about. This book isn't preachy about euthanasia at all but has a very powerful message. I personally don't think it needs to be under Christian ca A true thriller, this book really made me think. I will never look at ALS (Lou Gehrig's) or the idea of ending one's own suffering the same way again. But it's really a thriller, a sometimes-scary-serial-killer kind of book. You just end up more compassionate and aware of what so many people are dealing with. People a lot of us don't usually think much about. This book isn't preachy about euthanasia at all but has a very powerful message. I personally don't think it needs to be under Christian categories. I love the way Pence writes, and I just wish he would write more books. The scenes that take place on the huge hospital campus are so creepy! I've never thought about euthanasia the same since reading this book, and I didn't guess the killer! I love it when an author can pull one over on me like that. James Pence is a skilled storyteller who keeps you riveted through each page. You care about his characters and savor his plots. I hope he writes more suspense novels in the future. Almost nobody gets 5 stars from me - but this book was that good. When I am wrong about who the killer is, it is a good mystery. This is a fast-paced thriller, read it in a couple days, grabbing every spare second that I could. This book is amazing! I didn't expect anything from this book and tbh, I thought I wasn't going to like it bc I just accidentally picked this up and I'm glad I did! It's a thriller/mystery book but it also sends a powerful message.